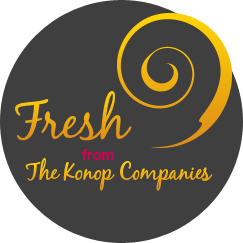 Konop Companies participates in the Exclusive Right Choice Program. "The Right Choice...for a Healthier You!" We deliver outstanding professional service. Whatever the occasion, Konop will customize a unique menu for your needs. Konop provides customers with a vast array of catering options. We offer an energizing variety of selections including sandwiches, muffins, fruit, salads and more. Every morning our in-house kitchen and bakery prepares your fresh food selections. We guarantee freshness with every purchase. We will customize your equipment and product selections to meet your needs. Unparalleled service using state-of-the-art equipment. Full service beverage solutions for any size company. We provide a wide variety of gourmet flavored coffee products. Energize your day with crisp, clean and refreshing natural artesian water. Each issue of the Right Choice Newsletter, by Carmen Gorniak, is filled with nutritional advice and healthy news for the whole family.